The typical retail bank invests significant resources in customer acquisition, offering an array of products and services designed to add value for consumers at the beginning of the customer lifespan. Unfortunately, mounting evidence suggests that banks may be underserving customers at the other end of the consumer life cycle. It’s a critical misstep, considering that a bank’s longest-held customers are usually among its most valuable. For banks, the most profitable customers are those who still come into the bank and who look to their financial institution as a trusted resource. Banks often prioritize the needs of one group that fits this description — small businesses — while overlooking the other: seniors. One of the most effective ways to retain mature banking relationships is to delight long-time customers with the personalized service and tailored product offers that attracted them in the first place. What many banks don’t realize is that there’s an FHA-insured home-equity program specifically designed to serve homeowners 62 and older, much like the popular, FHA-insured first-time homebuyer programs serve younger borrowers. Together, these products are the ideal “bookends” of a Generational Lending™ business strategy that supports customer retention by offering relevant products throughout the customer’s life. Retention of long-time customers is mission critical. In today’s competitive banking environment, building strong customer relationships and maintaining them across the consumer lifecycle is essential. Emerging technology is making it easier than ever for new entrants to challenge the status quo, and banks must continually adapt their product and service offerings to meet clients’ evolving needs — or face the possibility of losing those clients to rival financial institutions. The typical retail bank invests significant resources in customer acquisition, offering an array of products and services designed to add value for consumers at the beginning and middle of the customer lifespan. From cash incentives for joining the bank to low- or no-cost checking accounts to FHA-insured first-time homebuyer programs, these offerings meet consumers “where they are” financially and go a long way toward cultivating customer loyalty. Unfortunately, mounting evidence suggests that banks may be underserving customers at the far end of the consumer life cycle. It’s a critical misstep, considering that a bank’s longest-held customers are usually its most valuable. A recent study by Bain & Company confirms that the advocacy of loyal customers remains the most dependable driver of new customer acquisition. Moreover, as consumers mature and their assets grow, so does the opportunity for meaningful cross-selling of additional services that enhance the customer’s lifetime value to the bank. Retaining relationships over the long term is the surest way for financial institutions to attract new customers, increase the average number of products per customer and make up the cost of programs that “subsidize” borrowers early in the banking relationship. One of the most effective ways to retain mature banking relationships is to delight long-time customers with the personalized service and tailored product offers that attracted them in the first place. What many banks don’t realize is that there’s an FHA-insured home-equity program specifically designed to serve homeowners 62 and older, much as the agency’s popular first-time homebuyer programs serve younger borrowers. Together, these products are the ideal “bookends” to a Generational Lending™ strategy that supports customer retention by adapting to consumer needs as they change over time and creates customers for life. Is the HECM part of your toolkit? The FHA-insured Home Equity Conversion Mortgage (HECM) enables homeowners age 62 or older to receive a percentage of their home equity as fixed cash payments over time or as an available line of credit. Chances are, many potential candidates for a HECM loan are already your customers. According to Gallup, 89% of Baby Boomers have at least one checking, savings or money market account, 38% have a mortgage with the same depository institution and 21% use their bank’s investment services. Yet because this home-equity product is often misunderstood, only a small percentage of the 10,000 people who turn 62 every day in the United States take advantage of the benefits offered by a HECM. A HECM loan can make the last decades of your customer relationship at least as rewarding as the first. If you are not comfortable having a competitor provide the last one-third of your customers’ banking needs, you must be prepared to offer HECM loans. Black Knight Financial Services reports that homeowners gained a collective $260 billion in home equity in the first quarter of 2016, and according to Freddie Mac Chief Economist Sean Becketti, people over age 54 control nearly two-thirds of all equity in single-family homes. Yet while many of America’s 100 million adults over age 50 are equity-heavy, the traditional three components of retirement finance — pensions, savings (e.g., 401(k) and IRA accounts) and Social Security — are all challenged in the current economic climate. In fact, according to Jennifer Tescher, President of CFSI, “27% of Americans have saved less than $1,000 for retirement.” Even the most well-funded seniors have concerns about running out of money in retirement, given today’s skyrocketing healthcare and housing costs and ever-increasing life expectancies. Home equity is the under-considered bright spot in the retiree’s asset portfolio that could offer a possible solution to these concerns. Fortunately, new regulations have transformed HECM from a “loan of last resort” to a retirement planning product. Whether used in place of a HELOC or to supplement monthly cash flow, HECMs can make a real difference in the longevity of retirement savings. It’s why financial planners now consider HECMs when modeling the performance of retirement strategies. Banks that offer HECM products can help alleviate Baby Boomers’ concerns over long-term Social Security funding, low returns on investments and lackluster senior housing options while solidifying their reputation as a trusted source of financial services advice. It’s true — the HECM has not always had the best reputation. That’s exactly why the Department of Housing and Urban Development (HUD) overhauled its program over the last two years: to eliminate the risks associated with the early days of the program. Three key regulatory changes have made these loans safer than ever. First, HUD set limits on lump-sum initial withdrawals. Next, it added protections that enable qualified non-borrowing spouses to continue occupying the home and defer loan repayment after the borrower has passed away. Finally, and perhaps most significantly, HUD added a required financial assessment and available set-aside (think escrow) to ensure HECM borrowers have enough money to pay taxes and insurance. A study published in July 2016 found that the latest updates to the FHA-insured HECM program have reduced default risk by 50%. Can you think of any other financial product that has turned itself around so dramatically? A HECM isn’t a traditional mortgage; it’s a home-equity product that can not only replace a maturing HELOC, but also provide a line of credit that grows monthly and offers flexible payments options (or even no monthly payment). HECM funds are non-taxable and do not impact negatively Social Security or Medicare. As a matter of fact, taking out a HECM at age 62 is a great way to support delaying Social Security until full retirement age (66 or 67 for Boomers) or beyond for a larger payout. Once a HECM is established, the borrower has exclusive control over future draws on the loan, and there are no restrictions on how the borrower may use the funds. Draws on available HECM funds cannot be denied by the lender. In contrast, additional draws on a HELOC can be denied by the lender should conditions change. HECMs are also non-recourse loans, which means that if the value of the property decreases, the borrower (or his or her estate) will never owe more than the loan balance or the value of the estate, whichever is less. For all these reasons and more, a blind comparison sponsored by the National Council on Aging found that HECMs beat HELOCs hands-down as the home-equity solution preferred by consumers. Where do banks fit in? is programmed to focus on closing deals as quickly as possible. By contrast, with a HECM, the consumer already occupies their home, so it’s not about driving toward a closing date. The key to successful HECM lending is taking the time to educate the borrower on how to use the loan effectively as part of a financial planning strategy. This task is best performed by a trusted advisor — like a community banker. It’s a slower process, but a more rewarding one that allows bankers to strengthen their customer loyalty. In addition, because a HECM borrower’s Millennial-aged children are frequently involved in the decision-making process, bankers can create a promising lead pipeline of future HECM borrowers at the same time they are serving their current customers. If that’s not compelling enough, HECMs offers a much-needed avenue of relief for maturing HELOCs. Most HELOCs require low, interest-only minimum payments for the first 10 years. Then the loan converts into a fully amortizing phase, meaning the line of credit is no longer available for additional draws and the consumer must begin repaying the full principal and interest owed, usually over a 15- to 20-year horizon. The typical 11th-year payment on these loans is 30 to 70 percent higher than the payment in years one through 10, according to Experian, putting many consumers in a serious financial bind. The “payment shock” is expected to significantly increase the number of delinquencies and defaults among HELOC borrowers, which will mean higher incremental costs and significant credit losses for banks. More than three million HELOCs originated during the peak of the housing bubble will enter the repayment phase between now and 2018, leaving banks and consumers scrambling to find options. The most common solution is to refinance a maturing HELOC into a traditional mortgage or new HELOC. 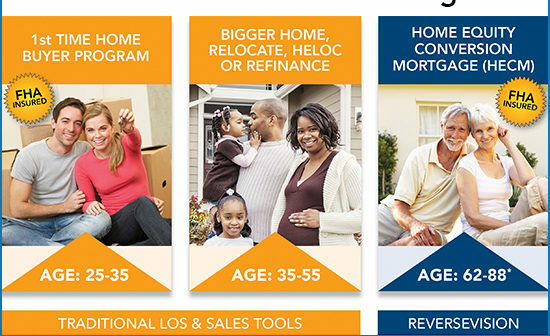 But a retired homeowner on a reduced, fixed income may not make enough income to qualify for these options. A HECM could be the ideal solution for HELOC borrowers over 62, especially those who don’t have the income to quality for other HELOC relief options. And by offering HECM as HELOC relief, banks can continue earning interest from customers who might otherwise default or look to another institution for a second home-equity loan. Three new mortgage bankers begin offering HECM loans each day. If you’re not making this FHA-insured home-equity product available to your qualified customers, it’s only a matter of time before someone else will. Fortunately, bankers are uniquely positioned as trusted financial advisors to their senior customers, and finding new ways to tap into these long-term relationships could help bankers offset market share losses. Educating senior customers on retirement funding strategies that include HECM loans is a powerful new solution that is a true win-win for the bank and the customer.